Thank you for all of the love and prayers in the comments. You are the sweetest friends! And another huge thank you goes out to those of you who have donated to help my brother's family lay their son to rest. I cannot even find enough words to express how grateful I am for such a loving community. We have had donations coming in from all over the world, and I am so touched by your support and generosity. I've been up until the middle of the night most nights this week talking to my brother or other family members on the phone. We've been crying and praying, trying to figure out what else we can do to help them from so far away. It is unbelievable how much funerals and burials cost. The national average in America is about $10,000 USD. Talk about kicking someone when they are down. It certainly makes me think about insurance. Who among us thinks about the possibility that our children may be murdered? As parents, it is our worst nightmare, but how many of us actually invest money specifically to pay for it in case it happens? To be perfectly honest, I haven't. I hardly ever let my children out of my sight, but that's not to say that something couldn't happen someday, especially once they go off to university. Whenever the thought of something that horrific stirs inside me, I push it away. It's unthinkable. Unimaginable. And yet... it happens all too often. It happened to my brother's son. KC was your average American teenager living in a small town. A 30 year old man preyed upon these teenagers, and my nephew stood up to him and was brutally murdered for it. His friends say he was protecting a girl. They say that he had a big heart, and if something wasn't right, if something was unjust, he wouldn't stand for it. He was no angel himself, but he felt a moral obligation in his heart to stand up even in the face of danger. He was a lot like my brother in that way. I remember my brother standing up for me when we were young. During one of these phone calls with my brother we talked about having to explain to our children what happened. It's hard enough to tell our teenagers, but our younger children... they have so many questions. They have questions about death anyway, but somehow when a person is old or sick, death seems to make more sense. When the person who dies is young and healthy, when it's murder, it is so much harder. How can fighting with someone make you die? Why are there bad people in the world? Will someone make me die? I don't know how much my brother's youngest was able to understand, but he had plenty of questions. My kids had questions, too. I shelter them from the news, media, and videos. I even preview books before I let them read them. My teenager still hasn't been given permission to read all the Harry Potter books, much to her chagrin, let alone those Hunger Games books her friends back home are talking about. So my children, probably much the same as yours, don't have much context to work out the ideas of murder. And when it's someone they know personally, their cousin... it's somehow scarier. I sat them down and told them in the simplest terms I could think of. Your cousin died. He was protecting a friend from a bad person, and the bad person hurt him. After they pressed me for more details, I told them there was a weapon involved-- a knife. I didn't dare tell them where or how because I can't even say those words aloud to myself, the details are so terrifying and unthinkable. But I did have to say that by the time the police arrived, he was already gone. His soul had left his body. It was an absolutely heartbreaking conversation, but I couldn't help to think how fortunate it is that our Waldorf homeschooling lessons don't gloss over some of the more terrible aspects of humanity. From the time we begin teaching them the fairy tales, they learn that bad ends come to bad people. Murder is something sort of mysterious and magical though, that can often be undone-- like in the Grimm's tale of The Three Little Men in the Wood where the queen gets tossed out the window into the river and turns into a swan. To bring her back to form (i.e. life) the king has to swing his sword over her head three times. If only it were that simple! 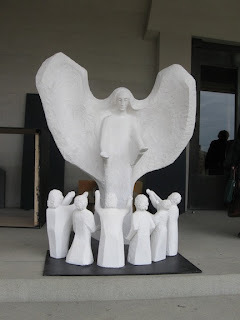 In grade two we teach them stories of saints and heroes, some of whom meet an unfortunate end. But how many of us actually tell those ends? In grade three we begin teaching the Old Testament. To me, this is where we really hit upon ideas of violence and murder with Cain and Abel. I remember telling this story to my girls and their eyes were wide in horror. I think the strength of the story serves a purpose at this age, but clearly I had no idea just how much I would need that story to be something they could call upon and examine so soon. We also have the making of knives by Cain's son, the theft of a knife, and how it's used to murder someone. My girls both remembered this story, and they grew very silent thinking about it. The tales of murder and destruction only increase from there. The Old Testament stories are rife with them, as are the tales from the ancient mythologies, Rome, the middle ages, and surely the reformation. The underlying message is that people who stand up for their beliefs, stand up for truth and righteousness, often get killed for it. We admire these people, they are heroes and martyrs. But it doesn't change the fact that they get murdered, often in cold-blood. It doesn't make it any less terrifying to think about. Moonshine, thinking of how her cousin died, reminded me that the Norse believed it was better to die in battle than in your bed. But perhaps most fortuitous of all, this week I had started telling Moonshine the story of Siddhartha, the Buddha, for her ancient India study. Siddhartha was a prince completely sheltered from all sorrow in the world. When he finally encountered the old, the sick, and the dead he was so troubled that he became a hermit and meditated on how to reduce suffering in the world. In the Kovacs' book Ancient Mythologies, Siddhartha asks the question: How can people and their souls become free of evil? Eventually, he receives an answer to his question, and he is transformed into an enlightened being. People and their souls can become free from evil through compassion, kindness, love, and pity. Through caring for each other more and more. It's a strong but simple message, one that hopefully brings my children peace. Continue on loving and living and caring for others, even in the face of sorrow and hardships. You've really brought that message alive for me this week. And I thank each one of you with all of my heart. My 18 year old nephew KC was brutally murdered on Sunday morning. My heart is broken for my brother and his family. As you can imagine, the loss of a child is so completely devastating. If you pray, please pray for them. 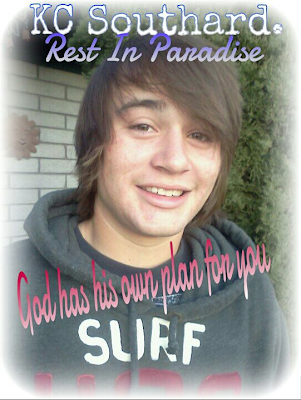 I have now set up an online donation site to help my brother's family with overwhelming expenses. I wish I could cross the ocean to hold his hand, but from overseas this is the very least I can do. So far we have raised just over $500. The generosity and love has been incredible. However, we still have a long way to go. Any amount is truly appreciated. As our trip to Switzerland was winding down, the rain was intensifying. I remember lying in the tent our last night and listening to it beat down with ever-increasing strength. It was so loud! Just when I thought it was raining really hard, it would start raining even harder. By morning the ground had become completely saturated and was running down the little street in rivulets. Once out of the tent, all the children became completely soaked. As if the rain weren't enough, suddenly water started pouring out of the ground in our old backyard/garden. It's too bad it didn't work! Farther back in the garden is some kind of manhole cover. It wasn't there when we first moved in-- or else it was only grown-over with grass. Sometime during our first year it suddenly appeared, and we wondered over the purpose of that too, just like the drain. On our last morning visiting, with the rain still coming down and the cow field squishy beneath my boots, suddenly the manhole started pouring out water at an amazing rate. One minute I was standing at the gate to my old garden talking with the postman, and the next minute water was gushing everywhere. It ran down the small incline and flooded our old back porch and the entire ground floor of the house. The water piled up and everyone had to think very quickly what to do. Boards were pulled from the porch walls, buckets and brooms were used to move the water into the street, and finally a dam was built to divert water from the house. It was incredible how quickly everything happened, and heart-warming how everyone quickly came together to help in a crisis. Merry meet, and merry part. And merry meet again. Unfortunately, as we made our way down the road we saw that our little farm wasn't the only place that had succumbed to flooding. The fields and allotment gardens were a terrible sight! Although it doesn't even begin to compare to the devastating floods seen in other countries this year, my heart broke for the families who work these allotments. It's confounding to think of the damage that just a few days of hard rain can do. And to think that we camped in that rain... and somehow we didn't float away. It's just crazy! We made it home after an exciting week away, and the children immediately started coming down with some kind of virus. One lone sneeze led to another and now all three children are at various stages of sickness--- coughing, sneezing, fevers. As usual it's the price we pay for taking them out into the world. It was worth it though, because it was a really fantastic trip. Our time in Switzerland was jam-packed with so many activities, there was hardly time to catch our breath. It was so wonderful to see our neighbors and friends again, and they all gave us such a warm reception. It was truly like coming home. The weather wasn't nearly as cold as predicted, but the relentless rain made up for it. As each day progressed the cow field became soggier and soggier. Aside from the fact that we were sleeping outside, it wasn't much different than living in England. However, that didn't stop our neighbors from worrying about us. We brought plenty of gear (or kit, as they say in England) and were fully prepared to cook all our meals, but between friends and neighbors we hardly had to cook anything at all. We were treated to so many lovely meals-- homemade bread, Indian food, salads, pumpkin soup, pumpkin spaghetti, apple pies, and snacks of all kinds. We felt so loved and well-taken care of. Oddly enough, we spent quite a bit of time at our old house. The new tenant was the first person I met upon arriving, and he immediately invited us over for coffee and to have a peek around inside. It's such a strange feeling to walk through your old house filled with someone else's belongings! But it was comforting to know that a nice family had moved in after us. He has turned our old porch into a workshop where he makes the most exquisite wooden bows and arrows. He talked us through the process, and all of us were so impressed. Kitty Bill was especially taken with him and kept asking for permission to go have a chat and offer his help. Sunburst was absolutely thrilled to be back. She spent our entire last year in Switzerland volunteering at a horse stable every morning and afternoon. She was so determined that she would set her alarm and wake in the early hours and be out of the house even before Einstein and I had risen from bed. 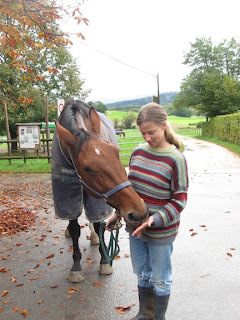 She mucked stables, swept, fed, and ran to watch every time the farrier or vet came to call. Aside from helping in the stable, she also helped with the cows-- mending fences, corralling cows, attending births, and finally helping to nurse an abandoned baby cow. So once again Sunburst set her alarm and rose in the early hours to help in the stable. This time she took Moonshine with her, and they were up and gone at first light. The smile on Sunburst's face every morning said it all-- this is where I belong! In between stall cleanings, horse riding, and visiting, I had a walk through the Goetheanum bookstore and took the kids for a day trip into the big city-- Basel. We hit all our favorite spots, and the kids were so happy to see that the Heisse Marroni (hot chestnut) vendors had already set up near the Rhine. We also managed to attend the Jugend Zirkus (youth circus) one night. One of our homeschooling friends had joined last summer, and it was so fun to see her transformation into a circus performer. She gave us a little behind the scenes tour of all the circus wagons. It was so fascinating! Twenty children participate in this circus and travel around from town to town, not only performing but setting up and taking down their circus tent. They have a team of wagons pulled by tractors, and the kids live together in the wagons during circus weeks. They even have a kitchen wagon and a bathroom wagon. The whole idea was so interesting, and of course so foreign to anything I grew up with in the states. Of course Sunburst immediately wanted to move back to Switzerland so she could join up. It's time for me to make more tea and wipe more noses, but I'll be back tomorrow to regale you with pictures of the flood. 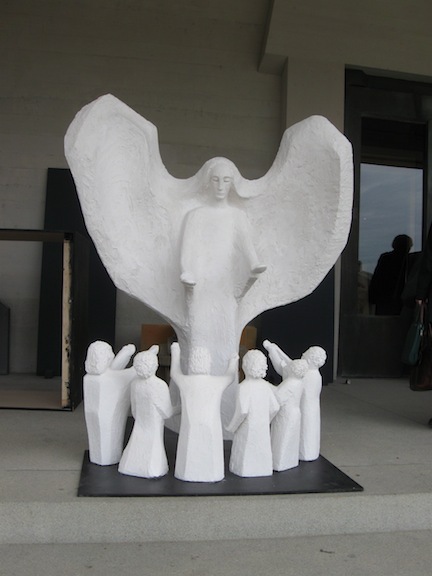 For today, I'll leave you with pictures of the new angel sculptures outside the Goetheanum. Aren't they lovely?! We've been busy preparing this week for a trip to the continent. We'll be gone just a week, but the kids are ecstatic about it because while our primary reason for going is work-related, we've promised to make a full trip of it and take them to visit the friends, horses, and cows they left behind in Switzerland. Part of my preparation for this trip is in the form of knitting. There are two little ones that I've missed dearly, and I wanted to bring them a little something special. So I've been busily knitting away some foods for their play kitchen. I had so much fun knitting tiny treats, that I went a bit overboard. But can you not stand the cuteness? The carrot and strawberry patterns are my own, but the others are mostly free patterns that I found online. And while the doughnuts are not the healthiest little treats, and the Swiss children probably won't even know what they are, I think they are adorable. Once I saw the pattern I couldn't help myself. It was so clever! And the garlic and mushrooms make me very happy. I actually knit more mushrooms than I had intended because Kitty Bill kept claiming them for himself. He loves them. And lest he be forgotten, my other knitting preparation was actually for Kitty Bill himself. Since we're planning to camp in a Swiss cow field for a few days, and it's near freezing, we need to dress warmly at night. While we were getting our winter gear out, he reminded me that I still haven't made him a hat. I've made Kitty Bill countless hats over the years, but I knew what he meant. A couple years ago I made Moonshine a special hat with elephants on it. And then Sunburst saw it and put in her order for one with horses on it. And Kitty Bill? He has since been begging me for a hat with robots on it. A kid who loves to build electrical things needs a robot hat, don't you think? But he didn't want any old robots, they had to be just the right kind of robots. Cute and friendly ones. He has been a fan of robots for years. Oddly enough, it all started when we moved to Switzerland. The moms in our area would get together and have a kind of yard sale (boot sale, for my UK readers) at the local park, and they would sell off their kids' outgrown clothes and toys. At one of these sales there was a giant, plastic monstrosity of a robot, and Kitty Bill went berserk for it. It was red with moving parts and sounds, and no doubt with enough batteries lasers would shoot out of its eyes and scorch something. He was two or three years old at the time. There was no way I was bringing it into our house, and no amount of distraction would budge his tiny heart. As I recall, there was a lot of screaming and kicking, but we made it home without the robot. I promised that I would make him one, and I did. I knit him this crazy transforming robot. I was good to my word, and he was so happy that the plastic robot monster from the park was long forgotten. But then robots became a thing, just like horses are with Sunburst; they are the magic key. 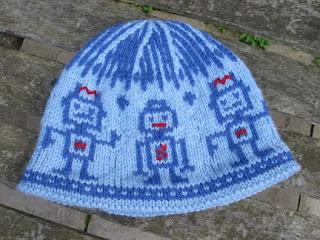 So if I wanted Kitty Bill to wear a sun hat, I had to embroider a robot on it. A winter hat? Robot. Eventually he grew out of that phase, they all do, but for a time I was thoroughly convinced that any woman that wanted to marry him would have to agree to having robots on top of the cake. But now he's seven, and he still wants a robot hat with cute robots on it. How can I deny him that? I'm happy to announce that it passes the cute and friendly test. Kitty Bill absolutely loves it. Now he can't wait to sleep with the cows! So now I have another pattern to share... but it needs a name. Any suggestions? 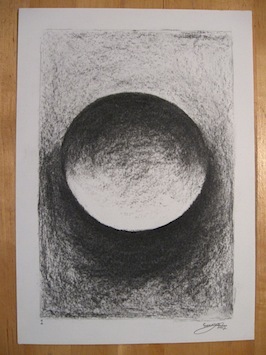 Sunburst and I spent some time over the summer exploring the lovely qualities of charcoal. We decided to tackle a series of exercises from Thomas Wildgruber's inspiring book, Painting and Drawing in Waldorf Schools, and we had so much fun. They start very simply with spheres, and then increase in complexity with each exercise. The guidance provided with these drawings is wonderful. 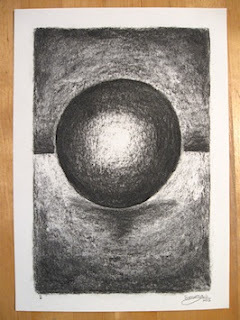 I was required to do a little bit of charcoal work in college, but with very little guidance. Looking back at my youth, I am so aghast that I paid and attended college level art classes that involved no actual instruction. While we inadvertently learn something through our own repeated ill-attempts, with guidance the process is much less painful and infinitely more productive. 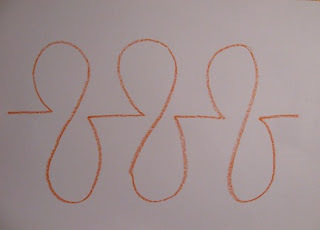 Another thing that struck me about these exercises is that even with such a simple medium, the results vary. While Sunburst and I were drawing the same things, stylistically, there is a huge difference. 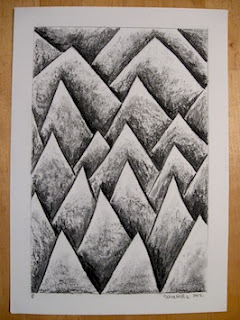 Her drawing style with charcoal has a scratchiness to it that no matter how hard I try, I cannot manage to replicate. The same is true for her-- she can't soften her drawings to match the feel of mine. We had a lot of fun trying though. And as Sunburst is getting older, she really enjoys it when there is something obviously off about my drawings. Yes, the teenage years have truly begun! Here you can see the style differences. I wonder if it has anything to do with temperament. At one point in the exercises you progress to drawing your own image using what you've learned-- the examples for this exercise differ between the German and English editions. Sunburst couldn't wait for this exercise, because of course she knew exactly what she wanted to draw-- horses! I was more reluctant because I had absolutely no idea what to draw. In the end though I managed to surprise myself. We took a small break from there to begin our study of discovery, renaissance and reformation. We hope to get back to it and complete the last three exercises-- trees and landscapes. The difference these charcoal drawings have made in Sunburst's renaissance artwork is definitely noticeable. On more than one occasion lately I have heard her exclaim, "Did I really draw this?!" We've moved on into taking the dark/light exploration into our work with colored pencils, and the results are really fun. Moonshine, meanwhile, has been watching this progression with awe. "Will I be able to draw like that too someday?" "No," Sunburst told her with all sincerity. "Your drawings will be even better." This is a book I've been wanting to write a review on for a couple of years. 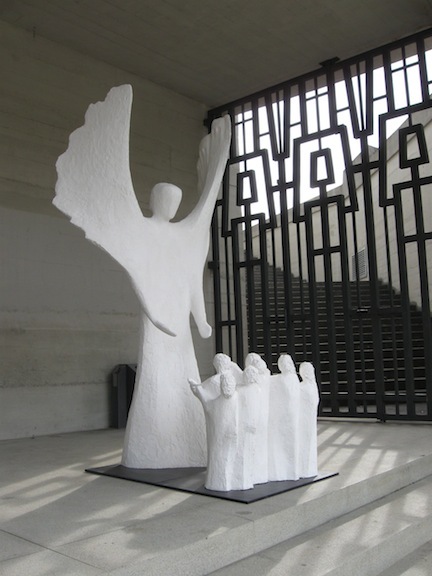 I first stumbled upon it at the Goetheanum bookstore in Switzerland with my good friend Cari. One look inside the book and we were both immediately smitten. It didn't matter that the text was in German or that its purchase price was enough to choke a horse-- we both HAD to have it. Early this summer it was released in English, and I hemmed and hawed about whether or not I needed a copy of it that I didn't have to translate. The pre-order price at The Book Depository made it worthwhile though-- a mere pittance compared to what my German copy cost me. So I winced only slightly before clicking the order button, and I'm so happy that I did, because while most of it is exactly the same, some things and images are different. Plus, it saves me the time and effort of translating. Let me repeat myself. This book is so good that I bought it TWICE. 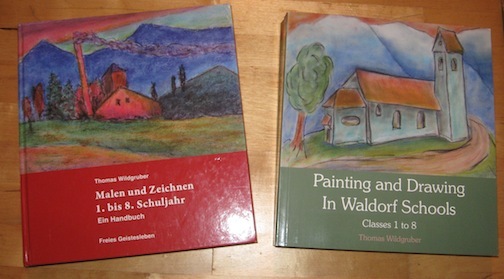 It's a wonderful guide to every type of painting and drawing experienced within Waldorf education. 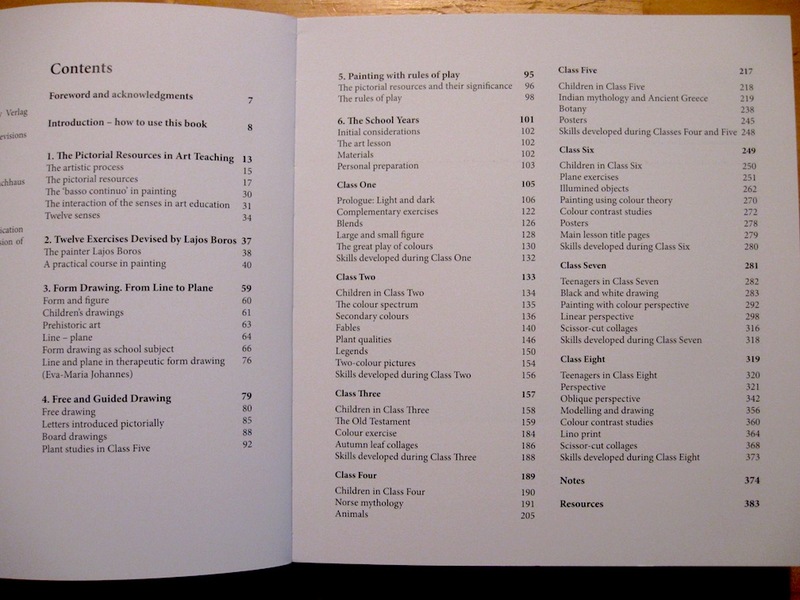 Almost every section contains step-by-step guides and thoughtful commentary. The pictures alone are so inspiring. This is the book I had wished for when I started homeschooling Sunburst so many years ago and had only the vaguest idea what main lesson artwork should look like. This is the book we've been waiting for. Included in this masterpiece are the beginning painting lessons-- the ones that leave most of us homeschoolers with our heads spinning. It goes on to give a wealth of painting examples for the main lessons in grades 2-5. As a busy homeschooler teaching three grades, there are not enough hours in the day to do this many paintings. But I love that they exist. I love being able to flip though the book and pick and choose a few ideas to bring here and there. Some ideas I change because that's the nature of art, and others I bring as is because they are just that good. One major thing this book has done for us is to re-enliven our form drawing. Form drawing is actually presented very differently in Europe than in the United States. Okay, I don't know if I can honestly say "all of Europe," but I can definitively say that the main lesson books I saw when I toured the Steiner schools in Switzerland were filled with very colorful form drawings, not much different from the ones in Wildgruber's book. 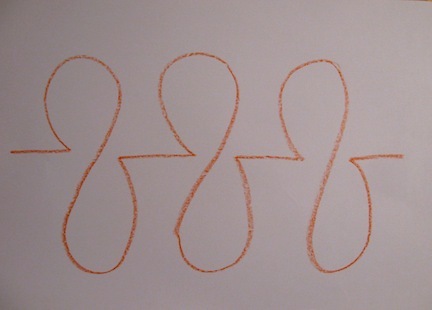 Here's an example from our own form drawing lessons so you can see what I mean. It's the same drawing, and yet it looks so much more impressive, inviting, and exciting. Shaded with rich contrasting colors it becomes this palpable thing. For those of us who were introduced to form drawing as practiced in the states, this is like a free pass. There is no need to wait for freehand geometry in fifth grade to make form drawing look this beautiful. 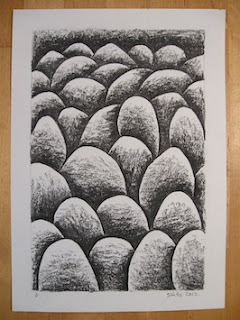 And it helps my children to fill in the enclosed spaces so they can really grasp the feeling-- did they create balance? Other sections of this book that I particularly love for the lower grades are the botany paintings and the drawing section with inspired artwork to display in the classroom. If only I could draw this well! The author goes so far as to recommend that children will learn more from our guided drawing examples on paper than from our use of blackboards. I have noticed this to be true with my own children, and it is so nice to hear someone say this. For the middle grades, I love that there are several wonderful explorations of light and shadow using different mediums. And as if the book wasn't already useful enough, the entire section on perspective drawing is priceless. I absolutely adore this book. I could go on and on. There is one series of exercises that Sunburst and I attempted over the summer that really lifted our work in so many ways. I look forward to sharing some of our drawings with you in the next few days, so I hope you'll come back for that. Now if only we had a book like this for the high school grades... Yes, I can dream!